Pint on Punt Backpackers i Melbourne, Australien : Boka nu! Within 7 days of arrival, the first night(per guest) will be debited from the card. Reduction in numbers will be charged in the same manner. No shows, the whole amount will be debited. Please note that NO REFUND is given within 7 days of booking for busy periods such as Grand Prix, Aust. Open, Christmas and New Year. Prices and availability are subject to change without notice. 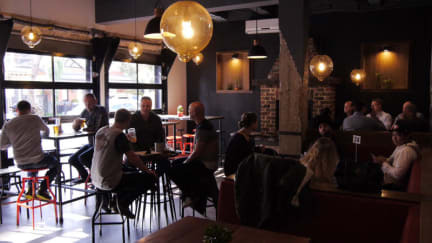 Pint on Punt Backpackers is located above the Windsor Alehouse on Punt Road. We offer free breakfast, free unlimited WiFi on each floor, cheap backpacker meals and drinks deals in the bar along with free wine and cheese nights, trivia night, open mic night (bring your instruments there's a free pint for performers!)) endless free tea, coffee and sugar. There really is something here for all backpackers! This hostel always has such a great atmosphere full of fun for those wanting to meet new people. The staff are a mixed group of friendly, helpful and knowledgeable people. Each have a diverse background and unique interests but have one very important thing in common-they also love the world of travel! They are happy to help with all inquiries and enjoy a good chat in the bar downstairs. Tours desk and booking service loaded with information on tours. PLEASE NOTE: Photo identification (International passport ONLY) and credit card information are required for each booking. We are an international guest hostel only - age restrictions apply to all rooms (18 - 35) with the exception of Grand Prix and Australian Open dates. We cannot accommodate large groups. If you are considering making a booking for 4 or more, please contact us first as deposits will not be refunded. Also if we are not contacted we can't guarantee your group guests will be in the same room together. The Pint on Punt is perfectly located to all the happenings of St Kilda including the beach, bars, clubs, cafes, movies, gyms, Chapel Street's boutique stores, Albert Park Lake and the Grand Prix circuit. If you're new to Melbourne or need to get some general things organised we have a large range of banks, supermarkets as well as the local post office close by. We are situated extremely close to main tram and bus stops and just a few minutes walk from Windsor train station. Stayed here during my first two nights in Melbourne and met so many nice people. The rooms were ok but the kitchen was way too small. Was a nice bar in the same building. No security lockers in the room. Location is good, walking distance to the beach. In between the city and the beach so its not very close to anything but not far away either. It was alright for a night but the showers were terrible. The staff was the best with this hostel, super helpful and always with a smile on their face. But that’s what was the good about the hostel. Uncomfortable beds, disgusting kitchen, not the best breakfast and the worst showers ever. The water alternate between scolding hot and freezing cold which means that taking a shower can take an hour just because you have to adjust the temperature all the time.